Last week, the Supreme Court granted certiorari in Hughes v. PPL EnergyPlus, LLC (“PPL”), its second case of the term involving the Federal Energy Regulatory Commission’s (“FERC”) regulation of wholesale electricity markets. Two days earlier, the Court heard oral argument in the first case, Federal Energy Regulatory Commission v. Electric Power Supply Association (“EPSA”). Following argument in EPSA, the prevailing wisdom was that the Court was divided, and that a 4-4 tie affirming the lower court opinion was a real possibility (Justice Samuel Alito is recused in that case). After the Court granted PPL, attention turned to what implications, if any, the decision to hear PPL had for EPSA, especially given the relatively unusual circumstances surrounding the Court’s decision to take the case: every court to have considered the issue in PPL had reached the same conclusion and the Solicitor General, the federal government’s lawyer before the Supreme Court, had urged the Court not to take the case. There are many possible relationships between the Court’s decision to hear PPL and the outcome in EPSA. At one extreme is the hypothesis that PPL has no relation to EPSA, other than its subject matter. One iteration of that hypothesis is that the decision to take PPL has more to do with Oneok, Inc. v. Learjet, Inc.—a case that the Court decided earlier this year and that has several similarities to PPL—than with EPSA. At the other extreme is the idea that the decision to grant PPL may indicate that the Court did in fact divide 4-4 in EPSA and now wants to consider the federal-state boundary on different facts and with a full court (no Justice was recused from the decision to grant PPL). 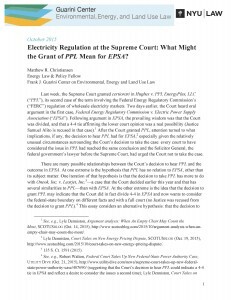 This essay considers an alternative hypothesis: that the decision to grant PPL might indicate that the Court has sided with FERC in EPSA, but is concerned about the potential reach of that decision.